Personalized marketing at scale represents a new way of communicating, selling and learning. It’s transforming our media approach and how successful brands are engaging with their leads, prospects and customers. It’s not a commodity any more. It’s what your customers expect, even when they don’t ask for it. You see, we belong to the data era, where companies like yours own or have easy access to tailored information about your customers and prospects. I’m not just talking about demographics, interests, location or even purchase history. I’m talking about the ability to reach different consumers with different creative messages. I’m not even talking about just a “customer” or just a “prospect”. I’m talking about Mike, who has a wife + three kids and is trying to find the best private school with advanced educational learning methods in Madrid, where they’ll be moving in 3 months from Charlotte. And nope… He doesn’t speak Spanish, not a word. In a normal discussion with someone else, face to face, in the same room, while we’re having coffee, we do whatever we can do get the other person’s attention; we use our hands, as many gestures as possible, we adjust our level of voice, our eyes, even the way we’re sitting and use as much information of context as we have available to communicate. We do this because it works, because they will remember us, because they’ll believe in what we say and because we’ve learned this since we were kids. Can you imagine how boring our conversations would be if they were all the same every single time? If we said “Good Morning” the same way in the elevator to our neighbor from the firth floor to whom we’ve never ever said a word before, to the guy that serves you that incomparable cup of coffee each morning? I can imagine the frustration of my wife if my conversations with her were as relevant as those with the guy at the bank. Up until recently, the rules of the game were very different. It was about catching one’s attention with noise (visual, textual and sonorous). The formats may have been the same, but little by little we realized the importance of the word “relevance” in our communications. We suddenly started to create better content that was more relevant and elaborate, content that didn’t just say word without a context… may be even a more natural content. Most of the times we didn’t do it because we wanted to connect more, but because certain individual called Google started changing the rules of the game with algorithms that looked for more than just repeated words. In the midst of all that tide there also were emails, sms, phone calls, landing pages, images, PDFs and of course, videos. We discovered that by using the name of the person the communication would improve. We then realized the inevitable… that we could create content, whatever it was, and based on the information we had from our clients and prospects… Some information was completely anonymous, others had a name and last name. Then our conversations started to skyrocket again, just as at the previous stages, because we were creating communications that were relevant, not just content. This process is being starred by marketing automation techniques and tools. Marketing automation can help you build strong prospect relationships. Remember, human relationships are the heart of modern marketing, but those relationships are impossible to maintain at scale and that’s why marketing automation works. Now you can deliver the right message, within the right type of content in the right moment in order to measure and improve the conversion funnel. A recent study by Yahoo finds that most consumers believe that personalization provides added relevance. That’s how 78% of those surveyed expressed a desire for some type of personalized content. There are more than half a billion live websites operating today (43% hosted in the U.S.). Competition for consumer attention and dollars is tremendous. We all have access to the same kind of tools (thanks to SaaS solutions for almost every pocket). To be able to succeed in this scenario, brands of all sizes will need to look beyond traditional measures such as reach and frequency, toward more contemporary and relevant metrics, measuring how effective and engaging a message is, regardless of the type of content. For example, our own personalized video solution can be integrated within any marketing automation software to deliver highly personalized video messages to engage with prospects during the sales cycle. 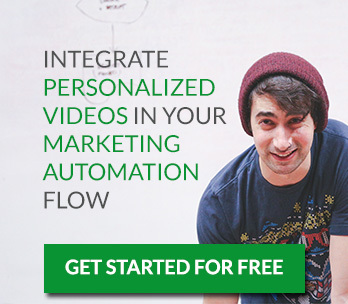 Personalized marketing videos are unique videos tailored for and from specific audiences, content or occasions. They are created on the cloud in real-time based on customer data or any other content feed. If you want to experience it by yourself, contact us via this landing page or even reserve a time slot for a Demo… Wait a few minutes… Then you’ll know what I’m talking about. Personalized content bring heightened relevance, deeper connections and creates trust between the brands and their customers. Why would you interact with Personalized Ad?? Personalized Marketing is here to stay and is, literately, taking over the world. The ability to reach different consumers with different creative messages, to communicate with them on a scalable way… that makes the difference. Effective marketing tends to require a targeted one-to-one approach, avoiding the risk of being perceived as overly intrusive. Just as Mike Kerns, SVP Homepage and Verticals at Yahoo said once: “Personalization gives each user a concierge online experience. It’s the web, ordered for you”. That makes it 54% more engaging. Marketing tips, Personalized Videos, Trends engagement, engaging messages, marketing automation, marketing personalization, personalized content, personalized marketing. permalink.